I've recently come back to Dogs Trust after maternity leave and was happy with the way pretty much everything came back to me in an instant! But time away and chatting to people about going back to work made me realise there are quite a few things people don't know about the charity. Of course our fundraising and education teams work very hard so they do know about the key objectives of the charity and much of what we do day to day. But I thought it might be nice to flag ten lesser-known things about Dogs Trust. If you find these interesting you can also read one of our most popular posts about misconceptions and myths surrounding Dogs Trust and rescue dogs. Actually, occasionally we meet people who think we still are! But we changed name in 2003 for a few reasons. One was that we thought 'dogs' should be in our name, and another was because 'defence league' suggested we were more for campaigning than actual care and welfare of dogs. Although we do of course get involved in campaigns where appropriate, what we're about every day is taking in dogs and finding them homes. On a related note, there is actually a reason why there's no 'the' or apostrophe in the charity's name. It was felt that 'Dogs Trust' suggested a double meaning: that we were a trust for dogs, and a group dogs could trust! Since the original NCDL started in 1891, we've come a long way. From private shelters set up in members' gardens, we've seen the milestone of the first purpose-built shelter, in West London, in 1912. By 1924 it was caring for 1,500 dogs a year. Now we care for around 16,000 dogs a year through a network of 17 centres across the UK, with a new one set to join in next year. The slogan 'a dog is for life, not just for Christmas' is itself over 30 years old, coined in 1978 by Clarissa Baldwin. Working in the press office for the NCDL then, she has since taken the helm as CEO and helped us go from strength to strength. We look forward to a great milestone of 125 years in 2016. Our Hope and Freedom Projects are often ones that surprise people who only know about our core work. The Hope Project helps owners who are homeless or in housing crisis ensure that they can keep their dogs with them and access veterinary care, while the Freedom Project arranges free temporary homing for dogs with foster carers so that women fleeing domestic violence can do so without worrying their pets will suffer. The Freedom Project currently only operates in Greater London, Hertfordshire and Yorkshire, with Cats Protection involved in London to help find temporary homes for cats. The Freedom Project is always happy to hear from fostering volunteers in the areas the programme is running in, and you can find out more about this and watch a video of existing foster carers on our website. Regular sponsors might be aware of the Oakfield Oldies, but not everyone is! Part of Dogs Trust Shrewsbury (until recently known as Dogs Trust Roden), Oakfield Oldies provides a quiet, very comfy environment for some of our older residents and can be sponsored as a whole. Despite their slightly more advanced years we know that older dogs can make excellent pets, so we never stop looking on their behalf and dogs have been rehomed from Oakfield before. Although you can't visit Oakfield as a sponsor if you are interested in taking on an older dog and are visiting Dogs Trust Shrewsbury, do let them know! Need convincing that an older dog is for you? 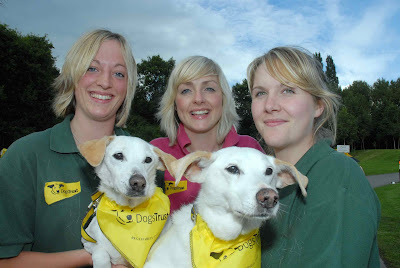 Read all about Chris McGrath and beloved pooches Dixie and Missy. In rare cases, we deal with dogs that prefer not to live with people. The Sanctuary is a large, secure field with shelter provided, which allows dogs to roam and form natural relationships within the group. They are happy, content and living a life free of the stresses with which they have shown they cannot cope. Food and health care are provided and there are two dedicated carers on hand to ensure they are well looked after. Although it's a misconception that all dogs come bundled with behaviour problems - many of our handovers are much-loved and well-trained family pets reluctantly given up due to financial problems, housing issues or a death in the family - there are dogs that need a helping hand getting back on track before a home can be found. For some of those dogs a stay in our STAR Unit, based at Dogs Trust Evesham, is needed, where they can receive the attention and training they need to cope with the stresses and strains of ordinary life. Incidentally, for those dogs that are not in need of help from STAR but might be nervous there are other methods used to help them in the transition from kennel to home. All new starters at Dogs Trust head office in London visit Dogs Trust Harefield within their first few months and one of the things that stood out for me there was their 'living room' - a room in the centre set up as a typical lounge where potential owners and the dog they were planning to rehome got to know each other in a non-kennel setting. Over the years we've learned more about the comfort and behaviour of dogs, and kennel design has changed as a result. Although some of our older kennels do still have the traditional bars and the dogs are perfectly content with them, we now prefer to build our kennels with glass fronts, and at a slight angle. 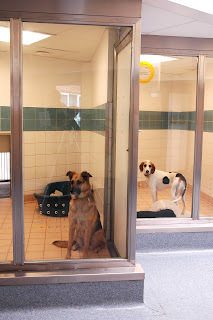 The glass allows both dog and visitor a better field of vision, and the way kennels are arranged means that visitors can see more dogs at a time, preventing dogs further down the corridor being overlooked, while the dogs are not placed directly opposite each other where stresses might arise. We are also able to employ more and more eco-friendly building techniques which not only improve our carbon footprint, but they reduce our running costs. For instance both Dogs Trust Dublin and the new buildings at Dogs Trust Shrewsbury employ solar panels and recycle rainwater to hoses for cleaning kennel blocks. Shropshire Live reported many more of the eco-friendly features of the Shrewsbury rebuild. Actually, we have two! They travel the country to help let people know about the dogs that are available for rehoming. The dogs that come along are carefully chosen to be up to the short trips and have two cosy kennels to retreat to whenever they want a rest. Cathy, the manager of Dogmobile 1, writes regular updates for the Dogmobile blog on our website, so if you've met her you might well be mentioned! 1. You decide you want to scrap your car. 2. It's picked up for free. 3. It's either resold at auction or scrapped, with proceeds from the car or scrap metal sale coming to us. You can find out more on the Giveacar website. We also have partnerships that helps raise money from booking holidays in dog-friendly cottages, recycling old mobile phones and ink cartridges, ordering personalised children's story books, and lots more. 10. There are no kennels in our London head office! There are a few dogs in the office, but they are all regular attendees with their owners; we don't rehome out of our Angel premises. Although some of our fellow animal welfare charities do have central London locations it's generally because they existed before the built up areas around them. These days building a kennel in an already busy area would be just a bit tricky! That's why our nearest centre to London is nearer Ruislip and Uxbridge in Harefield, where there's loads of room, and the offices in Islington are packed with people doing lots of supporting roles to help our centres do their vital front line work. what a great post. keep up the fantastic work.